Welcome to Jesus at American Theater Company is best described as a cross between “The Blind Side” and “Get Out”. I went to see it the day before Halloween and enjoyed quite a few jump scares. Will Davis’ direction is astounding as usual. When his directing style is at its peak, as I feel it is in this production, actors are comfortable enough to play and create within the seemingly choreographed production. As in a dance piece, Davis’ productions work well when you can sense the ensemble and they share an awareness of each other. The plot follows the fictional town of Hallelujah, Texas, where a family is grieving the loss of their son Paul to a tragic accident. Paul was the high school quarterback for the Trojans, and on his deathbed the team promised him they’d win the championship. As a casual observer, it’s hard not to notice the homogeneity of this town. This is heavily reinforced by Melissa Ng’s costume design, from the distinctive Trojan uniforms to Dixie Danver’s (Taylor Blim) long braid, woven with fabric so you can’t see where her hair truly ends. In a Rapunzel-like fashion, she grows the braid as long as the Trojans win championships, so you can see a physical representation of how important football is to Hallelujah, Texas. Blim does an excellent job representing white femininity as Dixie Danver; the tropes are obvious to the audience member so we know what she is conveying, but the persona has enough humanity that you feel you might know this person in real life. All of the characters are written with a remarkable honesty for such a surreal play, from Theo Germaine’s endearing portrayal of local jock Bud Henderson, to Stacy Stoltz’s grieving and manipulative Ma Danver. Josh Odor as football coach and possible demon Arthur Henderson has a hilarious and specific physicality that makes him too eerie to watch in the best way. Competition and tensions are high when all of a sudden we start learning about a scary woman in the forest who has been haunting the town for years. Once she’s dead and gone, the Sherriff (a hilariously stoic John Henry Roberts) and his clumsy goofy deputy Paul, played by Casey Morris who serves endless comic relief, are trying to dispose of the body in the forest. Deputy Paul has one job: watch the body. In a wonderful bit of stage magic (shout out to stage management), the corpse makes a getaway! The town of Hallelujah is changed forever when Him (Rashaad Hall) arrives in town. Anonymous and scared, recently separated from his brother, he is frantically running through the forest when he runs into Paul, the deputy searching for the body. In a troubling exchange involving a firearm being pulled on Him, Paul decides to have mercy on Him once he sees how well he can throw a football. Sound familiar? 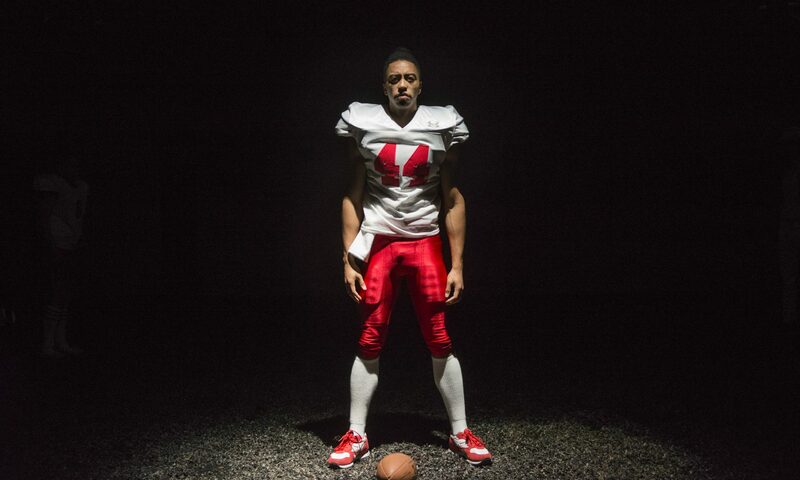 Rashaad Hall has a tall order as the only person of color in the play, with a series of physical sequences representing football, and a vast emotional journey, and he fills it well. In fact one of my only complaints is I think Him could use more dialogue and context, but with no one else onstage to talk to or reflect with that can relate to his situation, that could be difficult to achieve but could be fleshed out in a future production. Davis’ movement segments compliment Hall’s breadth of persona as he jumps and spins through space while the crowd cheers. Nabers’ play asks the question: what happens when they stop cheering? Lights, designed by Rachel Levy are an essential part of this production, and the use of them in the vast space plays up shadows and light to truly frightening effect. When paired with the ghostly sound effects of designer Jeffrey Levin, the suspense and terror rises accordingly. The actors have handheld flashlights that are sometimes used to light their own faces, sometimes other people, or to create a ghostly procession. Thick, knotted ropes that represent trees line the space, and to this viewer hinted at a far more sinister element. Overall, it is a brilliant use of ATC’s cavernous space by scenic designer Yu Shibagaki, complete with a bright red Americana display upstage center. American Theater Company’s journey under the leadership of new Artistic Director Will Davis has thus far been fascinating and fruitful. He has opened up a new way of creating, welcoming, and being in his space that the entire Chicago community should rush to appreciate. It is certainly one of the only spaces in town attracting both older middle class white folks and young queer folks of color. Watching a show of this subject matter and import only became more fascinating when viewed with such a diverse patronage. Nabers’ play is witty, subtle yet direct, and timely. I hope we can expect more productions of it in the future.